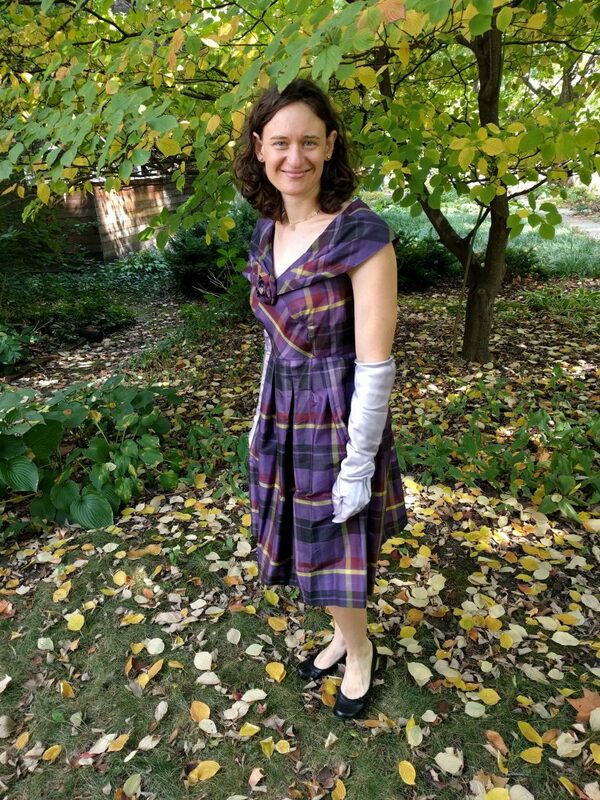 Fifties-style dress with PURPLE PLAID!!! The gloves were originally made to go with my wedding dress. I realized that wearing them would have made putting the ring on super complicated, though, so I never wore them. I may talk about them in a future post. 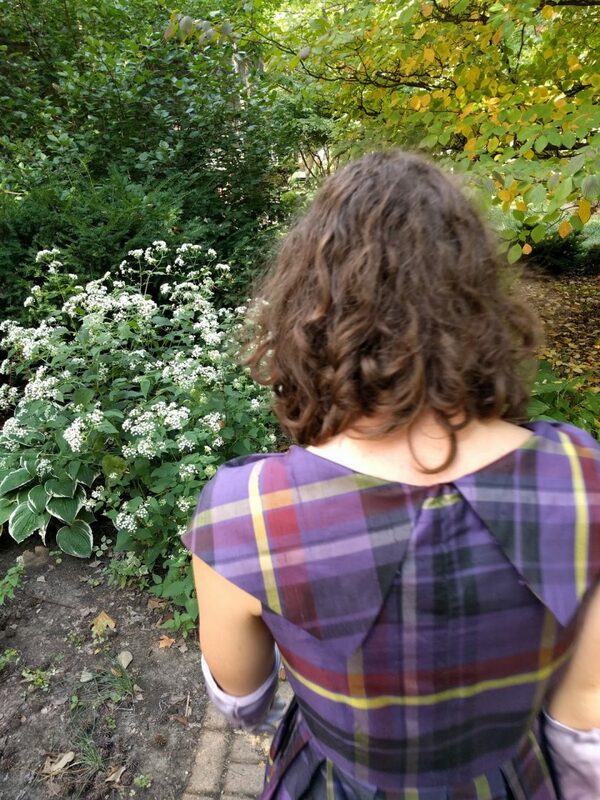 Check out that plaid matching on the back bodice! This first project with this fabric is not my usual style. 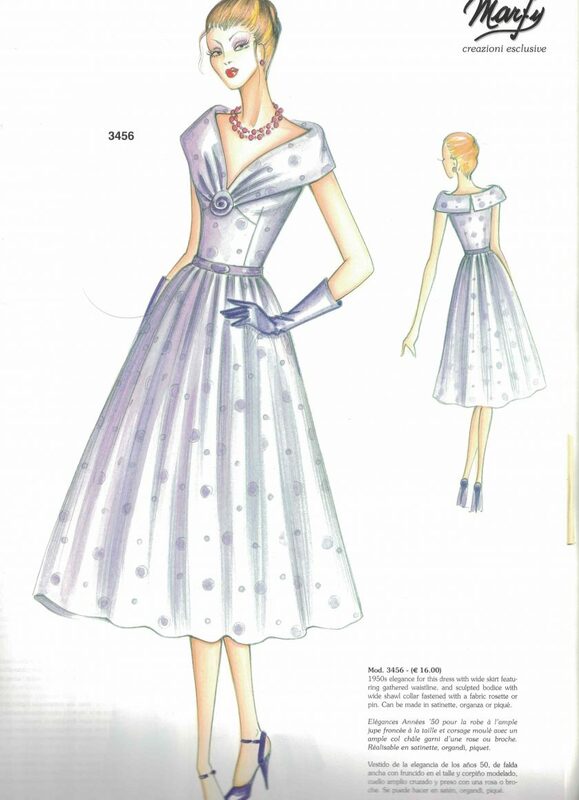 In general, I am drawn to ’30s styles for evening wear and ’40’s for day dresses. Not exclusively, of course; I like a lot of stuff. But ’50’s styles are not what I usually get excited about. 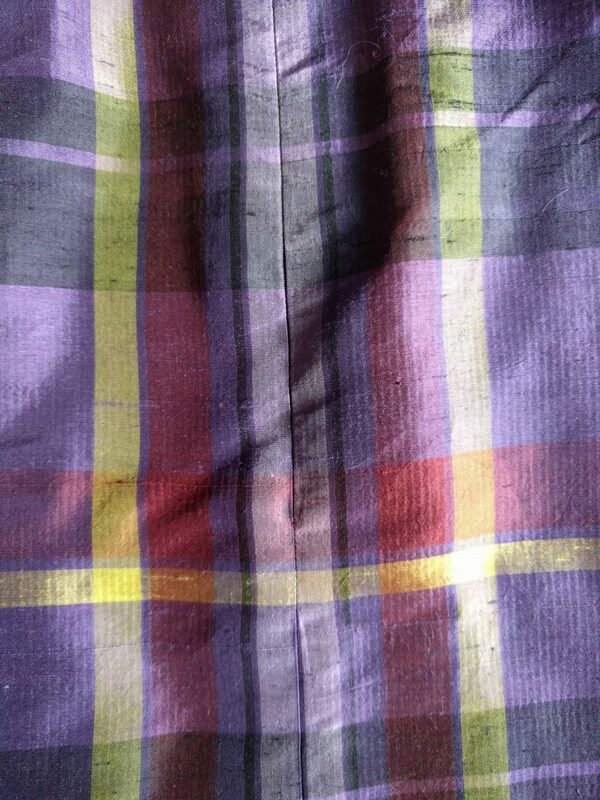 However, this fabric just wanted to be a fifties dress for me. I did not use a vintage pattern, or even a re-issue. It is a Marfy pattern (3456). I looked at a bunch of others, but once I had seen this pattern, it was the only one that felt right. I was especially in love with the fabric rose at the front, which of course is not even included in the pattern. Anyway, this dress came together really quickly. 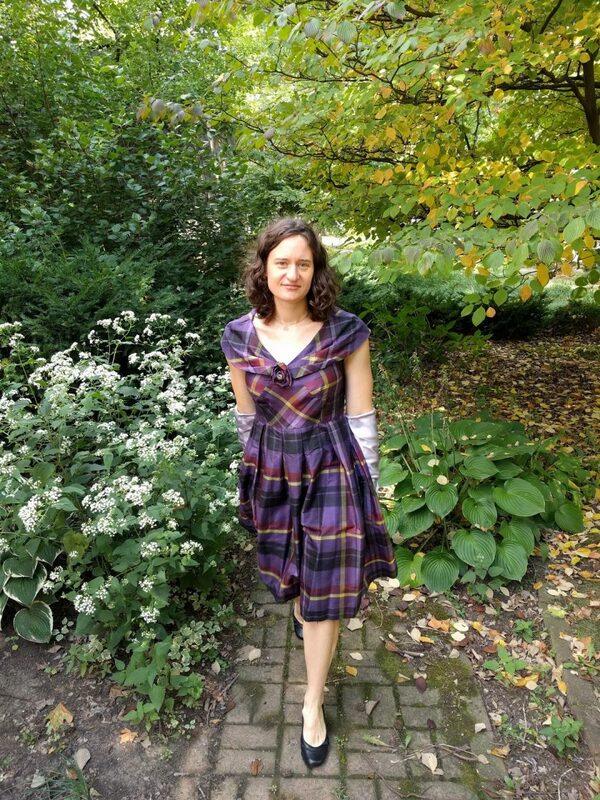 I just did my usual Marfy alterations, although I think I shortened the bodice too much by about 1/2″. 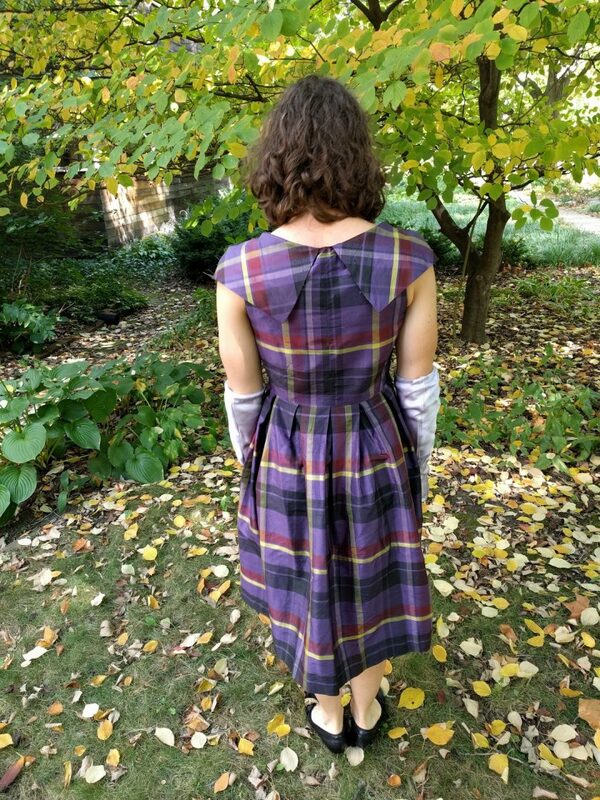 I matched the plaid on the back bodice and cut the center panel on the bias so that it didn’t need to match. 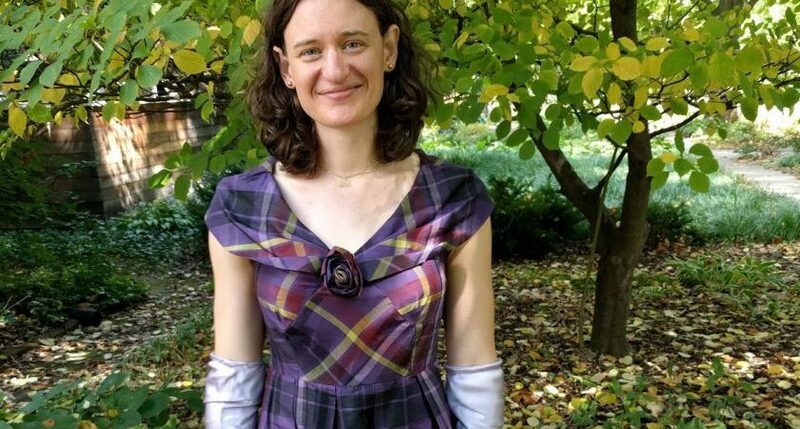 Because the plaid repeat is so large and I didn’t want to waste fabric, I only matched the plaid vertically on the skirt. 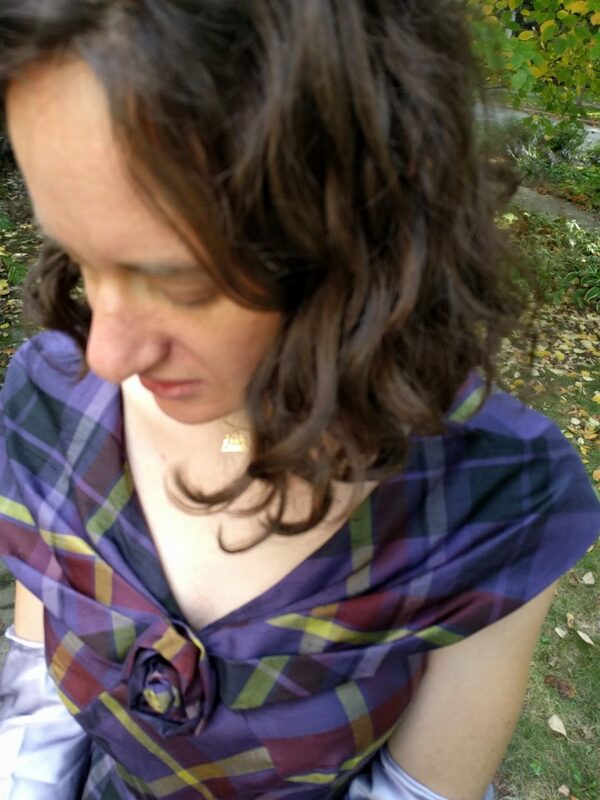 I used my walking foot to make sure the plaid stayed matched, and it turned out almost perfect. The bodice is lined, with the flounce part at the top sandwiched in between the lining and the fashion fabric. The skirt is unlined, and since there were only 2 seams, I finished them with rayon seam binding rather than serging for a nice vintage touch. Just look at that matching! 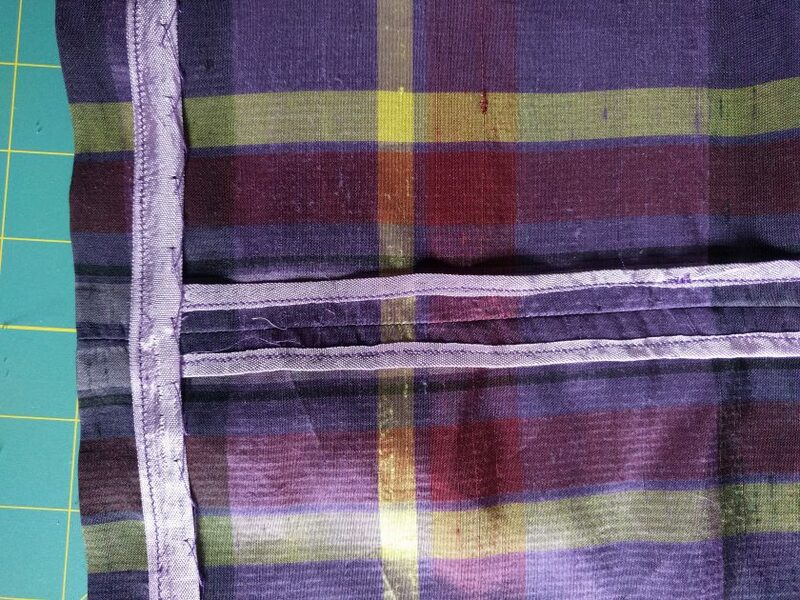 The hem is also finish with seam binding and hand catchstitched. Weirdly, the skirt did not match up with the bodice. I may have interpreted the folds for the pleats wrong somehow, or maybe there was an error. I just added in a couple pleats to the skirt to make the up the length and didn’t stress about it too much. Usually Marfy patterns have great drafting, so I don’t know what went wrong. The fabric rose was something I had never made before. I looked online for some guidelines about how to do it. Basically, you take a strip of fabric and just roll it up. I didn’t want any raw edges showing, so I folded my strip in half and sewed up one of the long sides. I also curved one edge to a point so that the inner part of the rose was little narrower. It’s actually trickier to make the rose than in looks because my first attempt looked terrible. I found I had to use a lot of hand stitches to hold the petals in place. I’m really happy with final result though! 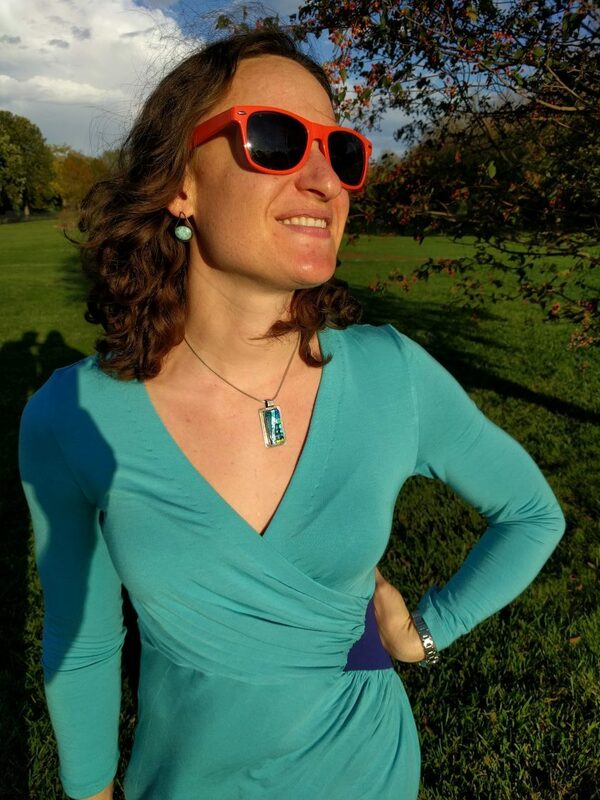 I wore the dress for my birthday. 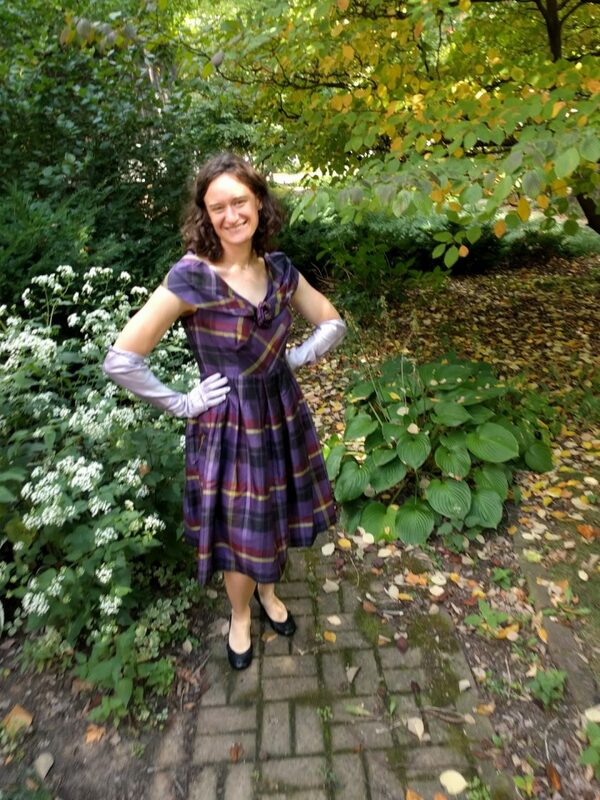 It was really fun to wear, although in the future I am considering making or buying a crinoline to wear with it. I think the skirt would be even more fun if it were bigger!